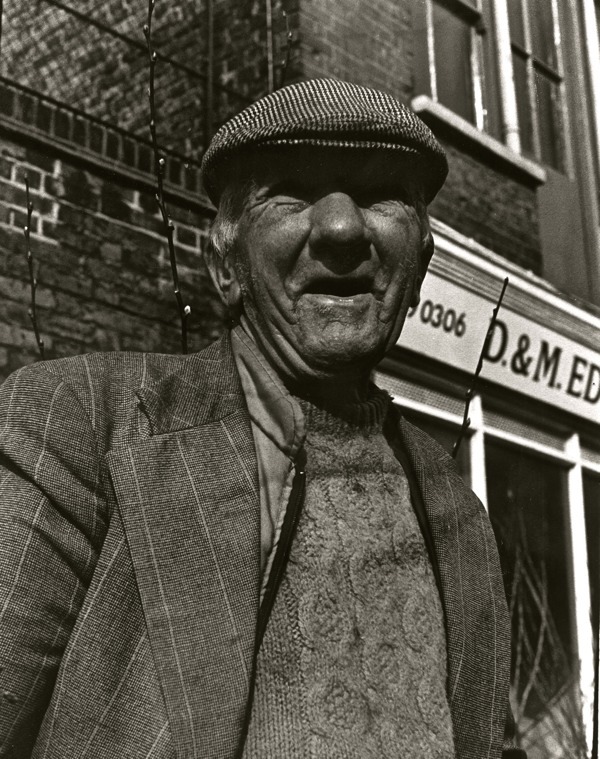 When Carl Grover was seventeen, he already had his own pitch at the market and, one Sunday in the late seventies, a photographer came along to take pictures, returning later with an envelope of black and white prints as a gift. This was long before photographers became commonplace in Columbia Rd, before the swarms of tourist with cameras that flock to the market today. Carl kept the pictures carefully in a cardboard file and although the photographer told him they had been exhibited, Carl never saw the exhibition. Carl still has a pitch in Columbia Rd Market and last Sunday he showed me the cardboard file of ten by eight prints by the unknown photographer that it is my pleasure to publish here today. 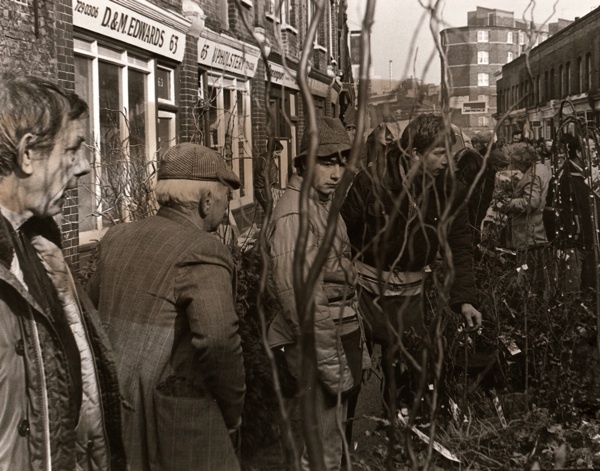 If you look closely at these fascinating pictures of Carl, his Uncle Bob, and pals Laurie and Lee at work, you can see they are selling plants without pots. 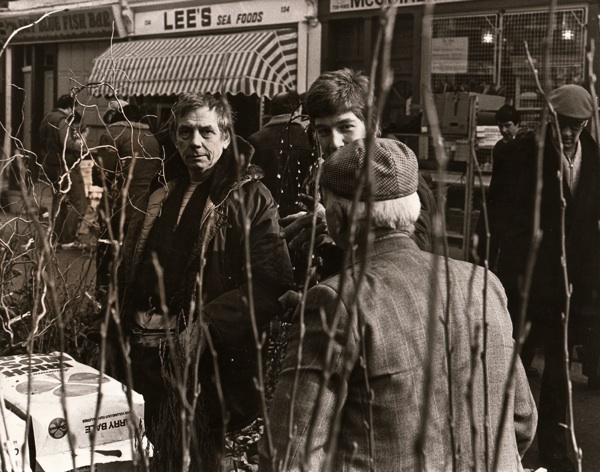 In those days, Columbia Rd was still lined with furniture trades and the atmosphere on Sunday was relaxed enough for stallholders to enjoy a drink from the pub while they were at work, as Carl explained to me. 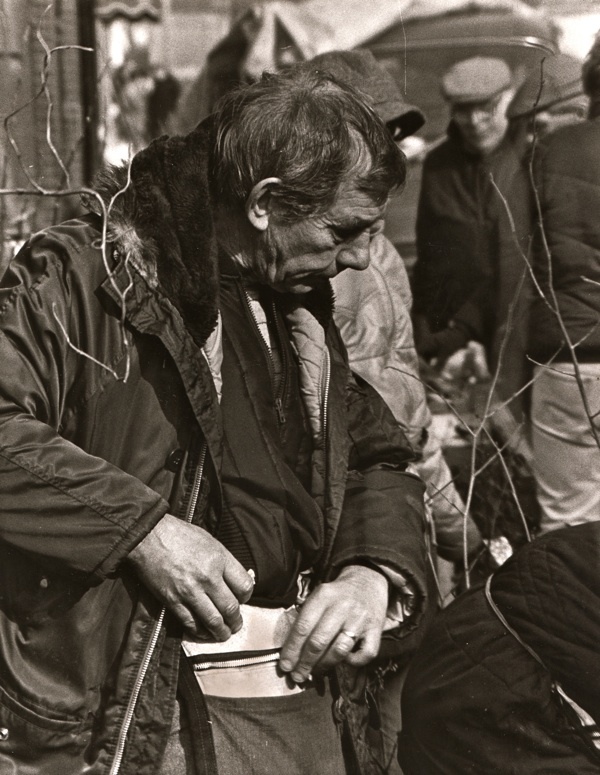 “I used to grow shrubs, and I went to auctions on Saturday and loaded up with plants, each with a root ball. By ten o’clock at night, I’d be driving up to the market to set up in my lorry, an ex-brewer’s articulated truck that had been used for transporting barrels. 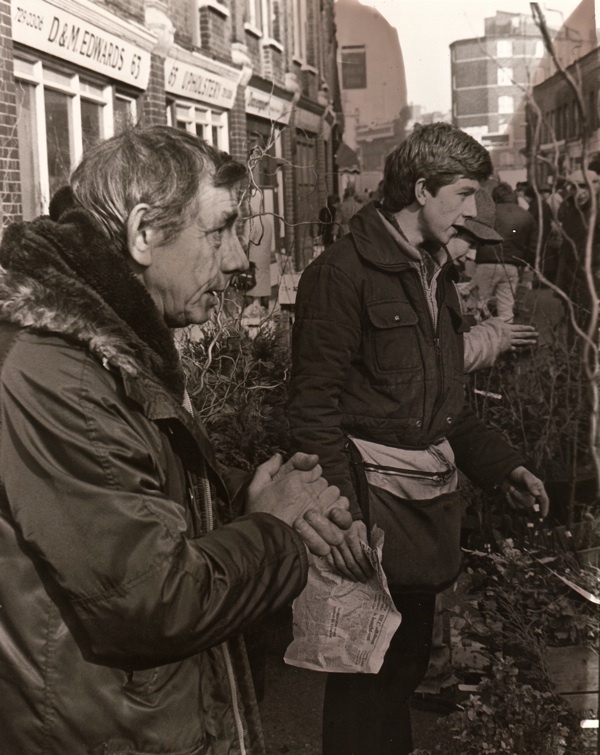 I started working at Columbia Rd on Sundays while I was still at school and and when I left it became my first job. We always sold cut flowers as well as plants but, when I sold off the nursery in the eighties, I switched over completely to cut flowers, which I sell today. 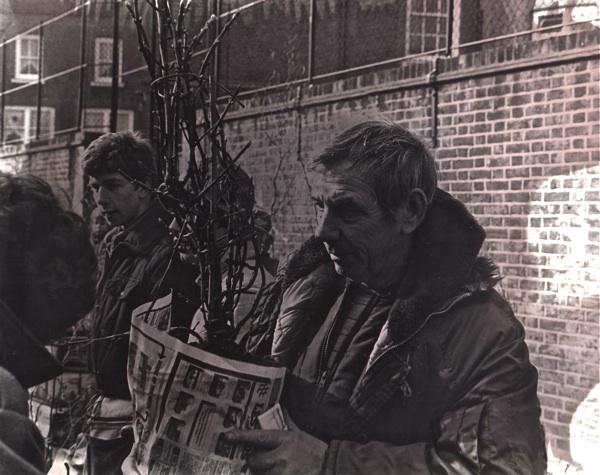 Laurie, the old man, he used to live in an ancient caravan close to the nursery where we grew shrubs and came along to Columbia Rd to lend a hand. He was an ex-navy man and sometimes on Sundays he liked to ride his bicycle on the wrong side of the road. He’d tell people, “On weekends, I cycle on the continental side, so I am ready for when we change over!” You can see him and my Uncle Bob with glasses in one of the pictures, they liked to have a drink from the Royal Oak. At seventeen, I had a pitch between my dad Mick and my Uncle Bob, a little further down from where I am now. In those days, there were no lines to mark the pitches, we had to go by cracks in the pavement. Years later, the market authorities painted lines and we all got jiggled around. At that time, we were selling delphiniums, lupins and hollyhocks – all the English cottage garden varieties – as bare root plants. 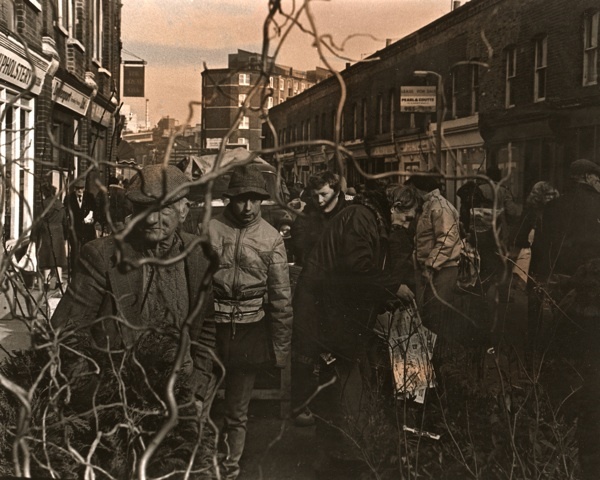 We wrapped them in newspaper, there were no carriers or plastic bags in Columbia Rd then. We saved papers ourselves, and people used to collect them for us too and bring them along, the posh people used to bring the Times and the Daily Telegraph. When I think about it now, it was highly sustainable what we did. It sounds a far cry from Columbia Rd today, lined with fashionable shops and cafes – a major attraction, drawing customers from across London and tourists from across the world. Yet Carl obviously still loves trading in the market and delights in the life it attracts. “Markets bring communities together.” he assured me, “Everyone’s equally welcome in a market, it doesn’t matter if you haven’t got any money.” Anyone that knows Carl will recognise him from these photographs of more than thirty years ago – he is still lean and eager and smiling, one of the most popular traders in the market. 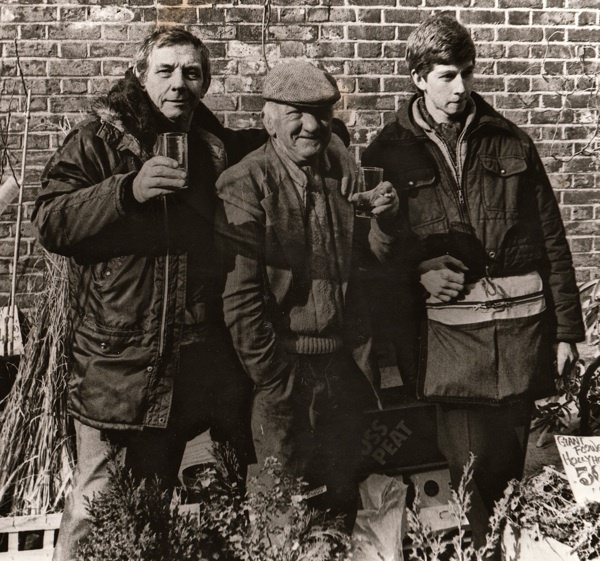 The young man in the centre is Lee Irvine who worked with Carl for many years. 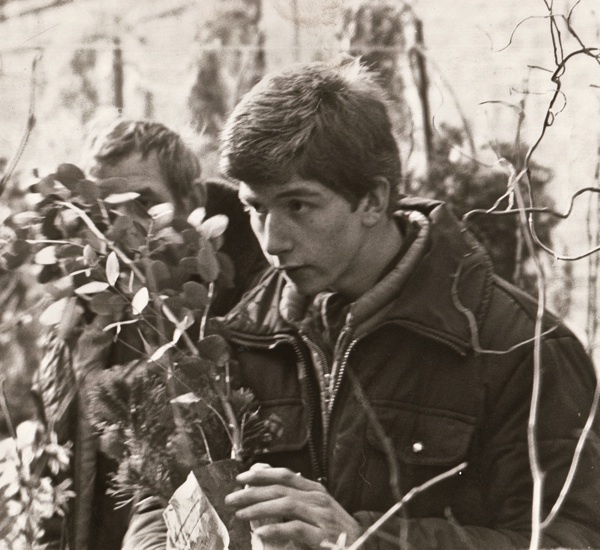 At seventeen, Carl Grover had his own pitch selling shrubs at Columbia Rd. Uncle Bob & Laurie enjoy a glass from the Royal Oak while trading. Laurie lived in a caravan, was partial to rum and liked to cycle on the wrong side of the road at weekends. In the 80s they used to sell a brilliant long grey mesh, flat bottom bag called a Columbia Carrier which you could stuff with plants. I just threw mine out today, it had almost completely disintegrated but it was the most useful plant carrier I ever had. Wish they were still made!